This class was taken at Blue Moon Glass taught by Gwen Youngblood. Talk about a class that was way over the top! Each student got to use a brand new workstation with all the trimmings! 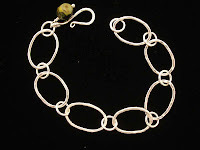 The course price included all materials including the fine silver required to silver fusing. What an experience. I've had some pretty negative experiences with beginning torch work classes and soldering so I wasn't so sure I'd enjoy this class, but with some encouragement from Jim (the owner), I signed up. Boy am I ever glad I did! Not only is Gwen a great instructor, but she gave me the room to explore outside of the prescribed lesson and that really made the difference. See that figure eight on the bracelet with the 3 beads hanging from it? 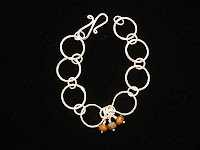 That was my idea to see if fusing a figure eight would work. Cool, huh? Had a great time. Made some great pieces in 3 hours times (yes, both bracelets and the 3 stacking rings were all made and completed in class and she even put them in the tumbler for us so they were polished by end of class). This class did a lot to undo the phobic response I was beginning to develop with the torch. You basically just make sure your cuts are flush and that the seams are perfect and then you heat the fine silver wire like you would to anneal but you let it go beyond glowing right to the point where it flashes and then you remove the flame immediately. The result is a ring without a seam, and without any solder or solder discoloration. Brilliant. LOVE THIS TECHNIQUE! Now to try soldering again....not sure if I'm ready for a soldering class again yet, but I have found the instructor I'm going to use, Rita Marie Ross, who comes highly recommended, when I AM ready. Her next class is being held the week of midterm exams this fall so I'm going to have to postpone it for now. Deep breath, whew! Oops, nope, she pushed out to the following week. I'm taking the plunge! Stayed tuned for the results from her soldering workshop!